I’ve heard of indigenous peoples of the Amazon using plant-based poisons to kill, or catch, fish. But to be honest, I never really gave it much thought until a recent article on National Geographic about incorporating these traditional methods to help with a scientific survey investigating fish diversity on the Manu River. 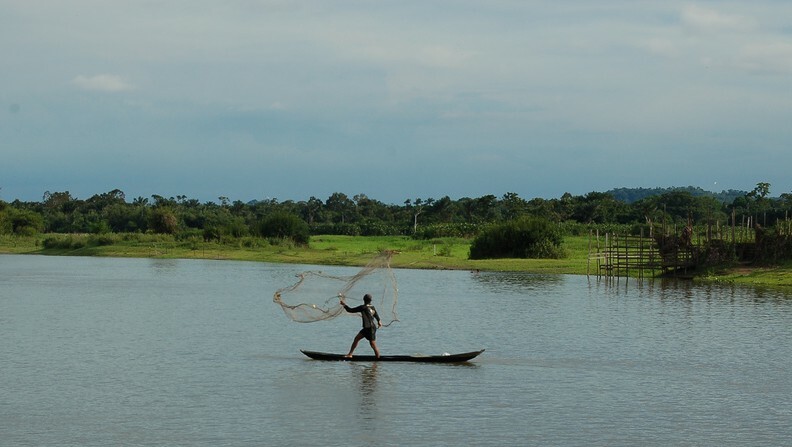 The Machiguenga people use the ground roots of the “barbasco” plant to poison waters upstream, where it “stuns” fish that are then caught in a net downstream. The locals, which derive a significant part of their diet from fish, are concerned about the decline in fish population, and the author, Emma Marris, writes “Used too often or carelessly, it can be a conservation concern; barbasco is powerful stuff.” Being the chemist and scientist that I am, I had more questions than answers regarding barbasco and its poison – which wasn’t the scope of the article – so why don’t we kick it up a notch? 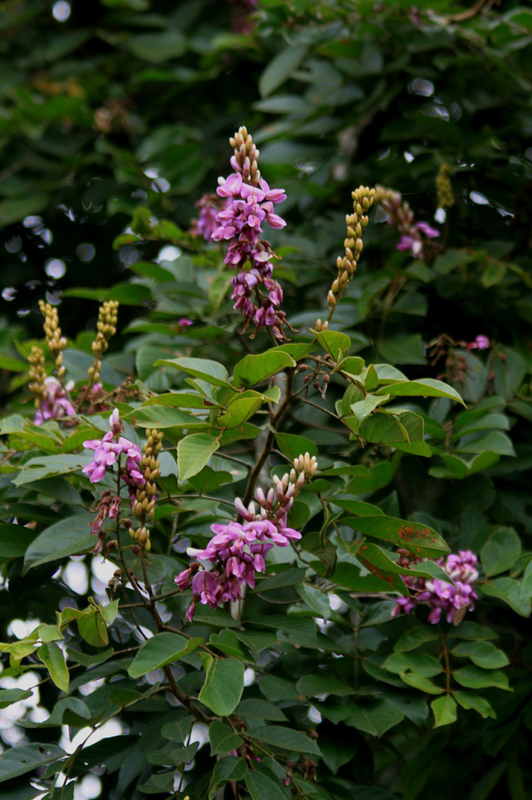 * Which other Nature’s Poison is from the Fabaceae family? That would be Swainsona galegifolia, the Darling pea, creator of swainsonine and loco-sheep. What all of these plants have in common is rotenone, a complex looking chemical that behaves as a natural insecticide, pesticide, and piscicide. What’s a piscicide, you ask? Something that poisons fish of course. The use of rotenone in the U.S. as an insecticide on farms was once so widespread that the FDA waived safety tolerance studies. Nice. But eventually enough anecdotal evidence poured in and led to the EPA suspending all agricultural uses of rotenone. A common complaint? Parkinson’s Disease. It’s use as a piscicide though, is still prevalent, and still has widespread use. The majority of its use is for killing off entire fish populations, such as when California officials poisoned Lake Davis to eradicate an invasive, and non-native, pike population. In this instance 16,000 gallons of rotenone was poured into the lake. It’s important to point out that rotenone is indiscriminate, and will poison (though maybe not kill) any fish, not just the ones you don’t like. Some fish though, depending upon size and other factors, are more resistant to the toxic effects than others. But there’s also the matter of poisoning water, groundwater, soils, other animals, and lest we forget, people. It was due to the short half-life and unlikeliness to leach from soil that rotenone was considered safe for agricultural use, and even considered non-toxic to human and other mammals such as dogs and rabbits. And this is partly true. I’ll explain. When administered powdered “derris,” prepared from the roots of plants of the Derris genus, animals died. Rabbits, rats, dogs, you name it. And they died in the similar all-or-nothing dose response, such that in dogs, 75 mg/kg would result in no deaths after 15 days, at 100 mg/kg nearly 50% died, and at 150 mg/kg all would die (4). If you’re a long-time reader of this site, you know that plants and animals don’t produce just one chemical and leave it at that. So you know that extracts of “derris” are a mixture of different chemicals and poisons, and are left wondering what happens with pure rotenone. You’re in luck. No effects were observed in dogs when fed up to 2000 mg/kg of rotenone (5). For perspective, the LD50 (amount to kill 50% of the population) of caffeine in dogs is only 150 mg/kg. So obviously there is more to the Derris extracts than just rotenone. So what gives? We have dogs that are fine when ingesting 2000 mg/kg and rats with Parkinson’s when infused systemically (straight into their blood stream) at moderate doses for weeks. You can probably see the difference between the two studies, but the one I want to highlight is the route of administration. Drugs or chemicals, when taken orally, are subject to the “first pass effect’. When swallowed, they are absorbed by the gut and enter the hepatic portal system where they taken up by the liver and metabolized. This effectively reduces the amount of parent drug that reaches systemic circulation. And rotenone is no exception, it is metabolized heavily in the liver. With that in mind, chronic ingestion of rotenone by rats – at doses 30 times greater than the previously mentioned infusion studies, and for 24 months(!) – failed to produce the behavioral and neuropatholgical features of Parkinson’s (7). So to me, I think the association between rotenone and Parkinson’s is greatly overblown. Now if I were writing grants to support research efforts to prove such a thing, I might be singing a different tune. But I’m not. So there you go. From fish, to mammals, and finally humans. I find it remarkable that old civilizations, and current ones, discovered how to poison fish and feed their families using a plant. How did the discovery occur, by who, and when? I guess I’d need a DeLorean time machine and 1.21 gigawatts to find out. Regardless, the history, science, and chemistry of rotenone and the barbasco and derris plants are intriguing, and such a great example of old and modern uses of one of Nature’s Poisons. 1. Clark, E. P. “The Occurrence Of Rotenone In The Peruvian Fish Poison “cube“” Science 70.1820 (1929): 478-79. 2. Amberg, Jon J., Theresa M. Schreier, and Mark P. Gaikowski. “Molecular Responses Differ between Sensitive Silver Carp and Tolerant Bighead Carp and Bigmouth Buffalo Exposed to Rotenone.” Fish Physiology and Biochemistry 38.5 (2012): 1379-391. 3. Cheng, W. W., and A. P. Farrell. “Acute and Sublethal Toxicities of Rotenone in Juvenile Rainbow Trout (Oncorhynchus Mykiss): Swimming Performance and Oxygen Consumption.” Archives of Environmental Contamination and Toxicology 52.3 (2007): 388-96. 4. Ambrose, Anthony M., and Harvey B. Haag. “Toxicological Study of Derris.” Industrial & Engineering Chemistry 28.7 (1936): 815-21. 5. Ambrose, Anthony M., and Harvey B. Haag. “Toxicological Study of Derris: Comparative Toxicity and Elimination of Some Constituents of Derris.” Industrial & Engineering Chemistry 29 (1937): 429-31. 6. Betarbet, R., T. Sherer, and G. MacKenzie. “Chronic Systemic Pesticide Exposure Reproduces Features of Parkinson’s Disease.” Nature Neuroscience 3.12 (2000): 1301-306. 7. Bové, Jordi, Delphine Prou, Céline Perier, and Serge Przedborski. “Toxin-induced Models of Parkinson’s Disease.” NeuroRX 2.3 (2005): 484-94. 8. Wood, D. M., H. Alsahaf, and P. Streete. “Fatality after Deliberate Ingestion of the Pesticide Rotenone: A Case Report.” Critical Care 9.3 (2005): R280-282. Tags: barbasco, derris, fish, insecticide, lonchocarpus, parkinsons disease, piscicide, rotenone. Bookmark the permalink. Rotenone is a naturally occurring chemical with insecticidal, acaricidal (mite-killing) and piscicidal (fish-killing) properties, obtained from the roots of several tropical and subtropical plant species. 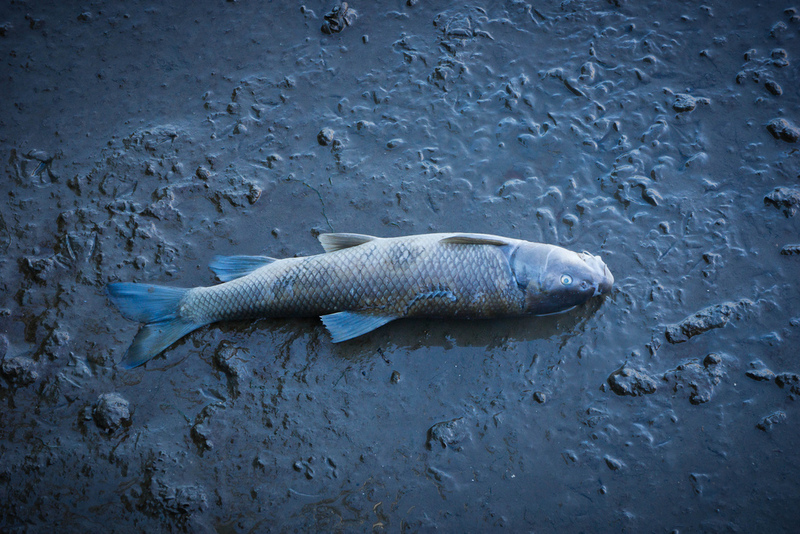 Rotenone is the most commonly used pesticide to eradicate fish populations as part of water body management.